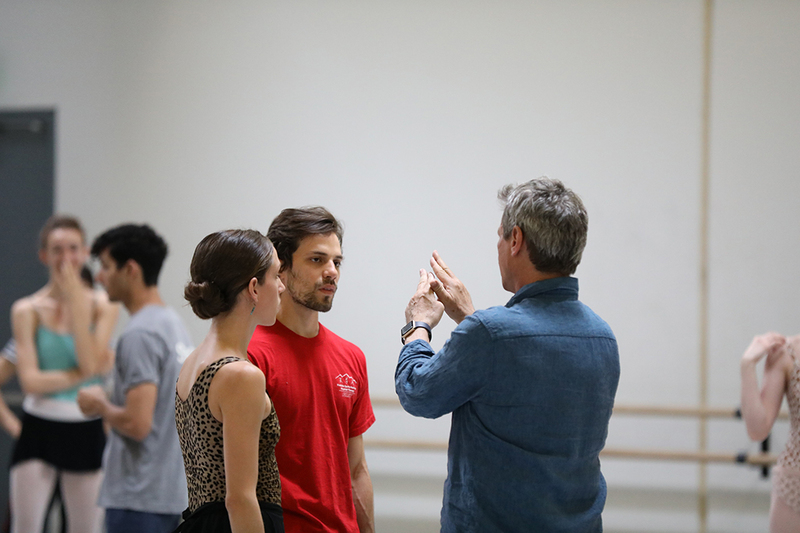 Jillian Barrell, Nayon Iovino, and Artistic Director, Ib Andersen, in rehearsal for “Eroica.” Photo by Tzu-Chia Huang. Tell us everything we want to know about your world premiere – Eroica. What can I tell you about it? Hmmm… many things. It is literally about the music – Beethoven’s Third Symphony is so complex. It’s easy to listen to and be moved by, but to understand the structure is not easy. I am not sure I even really understand it! But I like that element of it. When it was written, it was revolutionary. Over 52 minutes long – the emotional content and level of complexity just hadn’t been done before. Eroica’s choreography is about the past, present, and hopefully about the future. To a degree it is about our current political climate. The 1st and 2nd movements have the most meat and complexity including a funeral march. Then the 3rd and 4th movements are much more uplifting. They are a confirmation or belief that in human nature, good will survive over bad. This is not a story ballet, it’s an emotional ballet. I want to connect on an emotional level. I want you to be moved and not even understand why you are feeling that way. I am super excited about this one. I honestly don’t understand how I did this. For me, I created this very quickly – it just sort of poured out of me. And I trusted what I did. I think it’s because I’m so damn old. I go with my instinct now more than ever. I don’t second guess my intuition as much. Now you just have to come and see! Erick Garnica, Rochelle Anvik, Alejandro Mendez, and Arianni Martin in rehearsal for “Eroica.” Photo by Tzu-Chia Huang. Some of you ballet masters/mistresses have said you choreograph as if you are painting a canvas – is there truth to that? I have been painting for years, so I guess there is some truth to that. I see choreography as a stage (canvas) and you put people (or colors) on the stage and create a design. I am even more passionate about painting, sculpture and architecture than I am about ballet. Ballet is something I have done since I was 7, but I am not dying to see what other companies perform or seeking out new ballets. However, I am dying to see new exhibits. I will travel far and wide to see an exhibit, but I rarely travel to see a new ballet. Ballet Arizona dancers in rehearsal for “Eroica.” Photo by Tzu-Chia Huang. Click here to purchase tickets to Ib Andersen’s new ballet Eroica starting May 15th – June 2nd at Desert Botanical Garden. The rehearsal tonight was wonderful, really a moving piece and a great performance by the dancers. I enjoy seeing the entire company (almost) on the stage together, that provides a lot of energy.